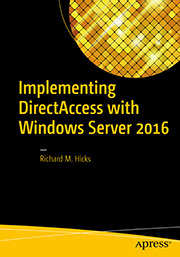 Implementing DirectAccess with Windows Server 2016 Book Now Available | Richard M. Hicks Consulting, Inc. 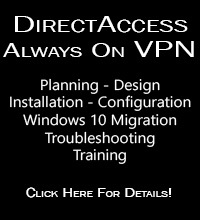 I recently sat in a meeting with Cisco regarding their AnyConnect client when I mentioned DirectAccess. After they laughed, they stated that Microsoft had given up on DirectAccess. 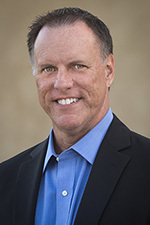 I can’t find any articles saying that they have so I was wondering if this is just a Cisco sales pitch or if there is some truth to it? Microsoft has indicated they will not be investing in DirectAccess going forward, so that means no new features or functionality in the future. However, it has not yet been formally deprecated. It is included in Windows Server 2016 and will be formally supported for the full lifetime of the OS.